Stagecoach. The Searchers. 2001: A Space Odyssey. National Lampoon’s Vacation. Mission Impossible. The Eiger Sanction. Forest Gump. Dozens upon dozens of movies have used its scenery as a backdrop. I’ve dreamed for years of going to Monument Valley since I first saw it as a kid on a Saturday afternoon watching She Wore a Yellow Ribbon. Now I’m here, and the reality of it is, as are most things we dream about, different. Monument Valley is located at the Arizona-Utah borders within the boundaries of the Navajo Nation. Some buttes are visible from the road, and our campsite had spectacular views at sunrise. Hiking is not allowed in the park unless you get a special backcountry permit, so visiting must be done in some kind of vehicle. 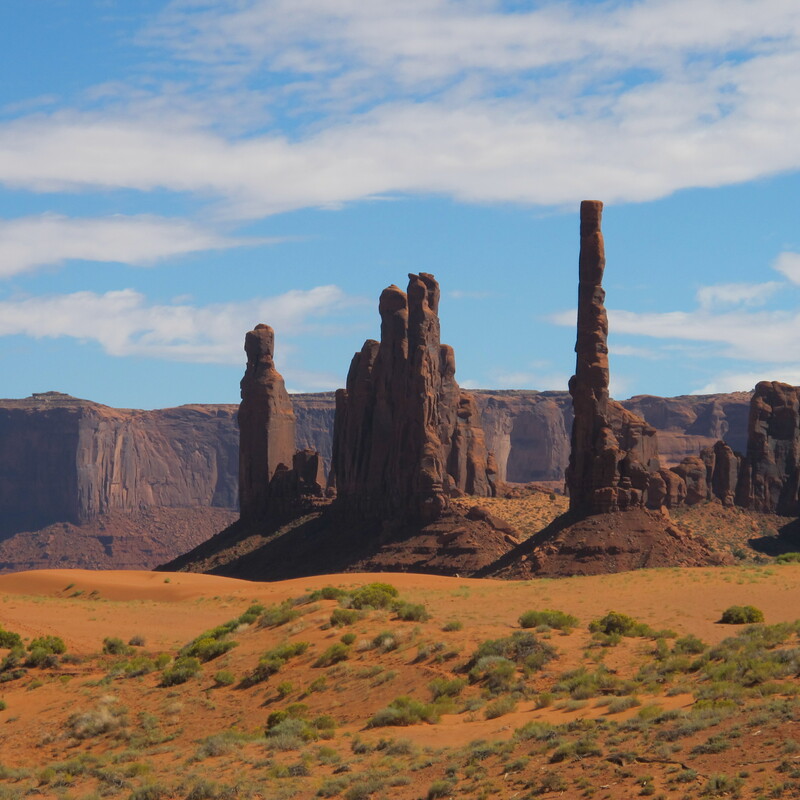 To tour Monument Valley, you drive a narrow and occasionally treacherous road through the various buttes and mesas. You can drive your own vehicle or jump on any number of for hire jeep/truck rides, or if you’re feeling inclined, you can contract a Navajo guide for a private tour that includes places only the guides are allowed to go. We elected to drive ourselves, and followed the park map. 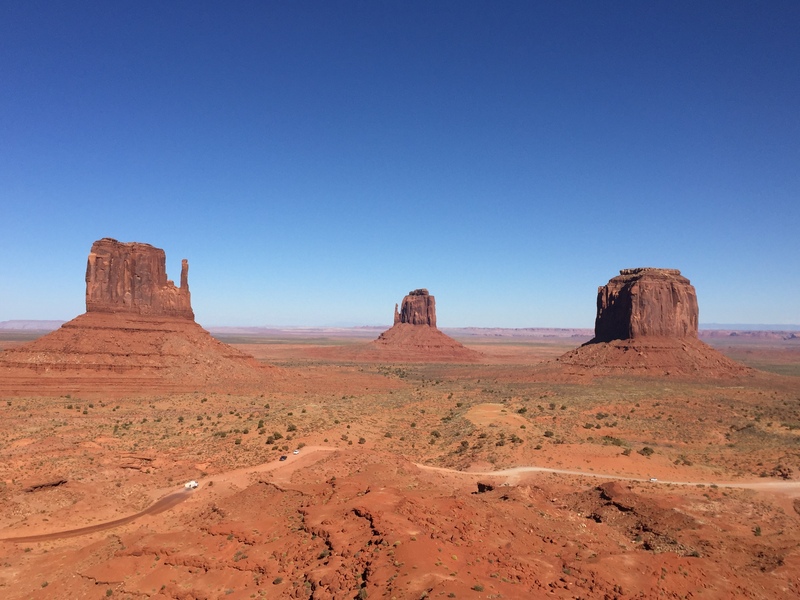 At John Ford Point is one of the most iconic views in the park (and on film). 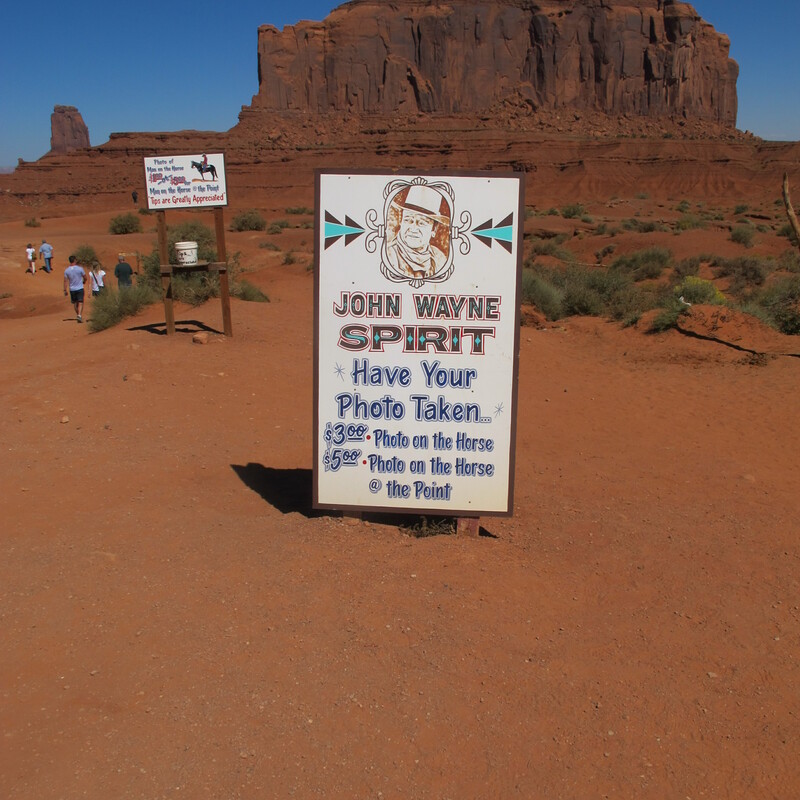 You can have your picture made in the same spot where John Wayne was filmed: $5.00 if you want to sit on the horse on the famous point, $3.00 just sitting on the horse. The horse, colored similarly to the movie horse, stood in the shade saddled up and ready, munching hay. At the same location, there is also a touching memorial to a Navajo with the last name of Cly, that is tucked behind the gauntlet of jewelry vendor stalls that are at just about every scenic stop. Open air tour trucks bounced people through the valley at an alarming rate, passing us slower more careful car owners. As they passed us in a cloud of dust we saw passengers holding anything they could find to cover their faces. We were glad we chose to drive our own car. People live and work in the valley or some have temporary summer camps set up to sell wares, offer tours and horseback rides. As we drove, we had to be mindful of the dogs who were wandering the scenic pull outs or hanging out nearby in a patch of shade. Some of them would come up to you to beg, others just hung back quietly observing the steady stream of gawkers. It was an amazing drive. Beyond the movie nerd thing, it’s easy to see why this is a sacred space to the Navajo People. Stare at a formation long enough and you can start to see shapes emerge from them; animals, people, places. It truly is a place with a deep old soul. It’s not the kind of a park that exists just for visitors to admire, it’s a place to live, work and worship. The sheer size and scope of the formations is difficult to represent in photographs, at least not mine. We spent three hours driving slowly, slowly through the park. I took dozens of pictures, thank God for the digital age. This morning we packed up to head on to the next adventure. I took one last look out into the valley, shook as much red Utah dust as I could off our boots, dogs and rugs and then we headed out. These are called the totem poles. I read that they were used in the filming of The Eiger Sanction. No climbing has been allowed since. On the horse or on the horse on the point; your choice. At John Ford Point. No horse. Different view of John Ford Point. Distances are hard to grasp in a picture and in real life. 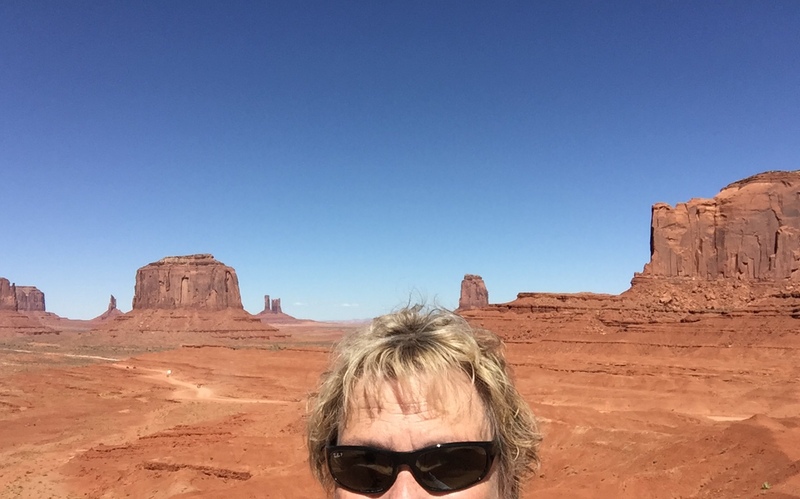 I’m so enjoying your adventure through the West!!! Lee and I had a few adventures of our own, especially in our first motor home (the Travco) that kept falling apart in various ways! Enjoy! Such a great photo set (I’ve really enjoyed watching this most recent trip of yours). I interpreted a film class and we watched Stagecoach; such a beautiful backdrop.